Slot Machines - More than 1,700 slots. 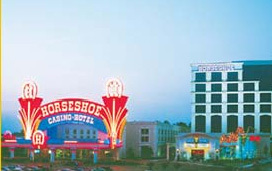 A trip to Horseshoe isn't complete without visiting one of our celebrated restaurants. Enjoy fine dining elegance at Jack Binion's Steak House, family style Asian at Noodles, all-you-can-imagine variety at the Village Square Buffet and around-the-clock snacks and more at Ace High Snack Bar.